Liao, Y., Fung, T. S., Huang, M., Fang, S., Zhong, Y. and Liu, D. (2014). RNA Isolation and Northern Blot Analysis. Bio-protocol 4(6): e1077. DOI: 10.21769/BioProtoc.1077. The northern blot is a technique used in molecular biology research to study gene expression by detection of RNA in a sample. With northern blotting it is possible to observe particular gene expression levels during differentiation, morphogenesis, as well as abnormal or diseased conditions. Here, we examine ATF3, ATF4, and GADD153 gene expression profiles by northern blot in Vero cells and H1299 cells after IBV infection. RNA was extracted in IBV (infectious bronchitis virus) infected cells and electrophoresis was used to separate the RNA sample. RNA was transferred from the electrophoresis gel to the blotting membrane by capillary transfer. Specific mRNA was detected with hybridization probes complementary to part of target sequence. The probes were prepared by RT-PCR and labeled by digoxigenin (DIG) using DIG labeling kit. Note: It contains more vitamins and more glucose, as well as iron and is suitable for most types of cells. Note: This medium contains a great deal of phosphate and is formulated for use in a 5% carbon dioxide atmosphere. 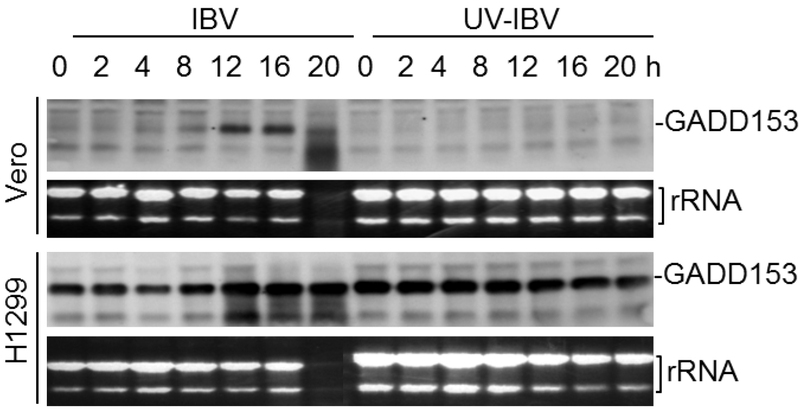 Cells were seeded in 100-mm-diameter dishes and infected with either 2 PFU of live IBV per cell or the same amount of UV-inactivated IBV (UV-IBV) at 37 °C. Excess virus in the medium was removed by replacing with fresh medium at 1 h post-infection. The IBV-infected cells were incubated at 37 °C in 5% CO2. At the indicated time points (0, 2, 4, 8, 12, 16, 20, 24, 28 h post-infection), cells were rinsed with 10 ml Phosphate Buffered Saline (PBS) buffer once and lysed in 1 ml TRIzol for 5 min at room temperature. Cell lysates were transfer into eppendorf tubes and one-fifth (volume/volume) of chloroform was added to each tube. Shake tubes vigorously by hand for 15 sec and incubated for 3 min at room temperature, then centrifuged at 12,000 x g for 15 min at 4 °C. The upper aqueous phase was transfer into a new tube and mixed with 1:1 (volume/volume) of 100% isopropanol, and then incubated for 10 min at room temperature. RNA was precipitated by centrifugation at 12,000 x g for 10 min at 4 °C. RNA pellet was washed with 1 ml 70% RNase-free ethanol once and spin down by 7,500 x g for 5 min. The RNA pellets are air-dried and dissolved in 100 µl RNase-free H2O by incubating at 65 °C for 15 min. RNA concentration and purity were determined by NanoDrop. The RNAs were stored at -80 °C for further use. Northern blot probes were obtained by RT-PCR and labeled by digoxigenin (DIG) using DIG labeling kit described as follow steps. 2 µg of total RNA is added to 2 µl of 10 pmoles of an oligo (dT) in a sterile 0.2 ml thin-wall Gene-Amp PCR tube of a final volume of 10.5 µl. After denaturation at 65 °C for 10 min, the tubes are cooled on ice immediately. The denatured RNA-primer mixture is then added to a final volume of 20 µl reaction mixture containing 10 mM of dNTPs, 20 units of Rnasinâ ribonuclease inhibitor, 1x Expandä reverse transcriptase buffer and 50 units of reverse transcriptase. The first strand cDNA is synthesized at 43 °C for 1 h, and reaction can be terminated by heating at 65 °C for 10 min (optional). Amplification of cDNA was achieved by polymerase chain reaction (PCR) in a 25 or 50 µl reactions containing of appropriate primer pairs and PFU polymerase using the DIG labeling kit according to the manufacturer’s manual. Primers used for human ATF4 were 5’-CCGTCCCAAACCTTACGATC-3’ (forward) and 5’-ACTATCCTCAACTAGGGGAC-3’ (reverse). Primers used for human ATF3 were 5’-GGTTAGGACTCTCCACTCAA-3 (forward) and 5’-AGACAGTAGCCAGCGTCCTT-3’ (reverse). Primers used for human GADD153 were 5'-GATTCCAGTCAGAGCTCCCT3' (forward) and 5'-GTAGTGTGGCCCAAGTGGGG-3' (reverse). Prepare a 10x concentration solution of each respective PCR primer. Add the following reagents in a 0.2 ml reaction tube on ice, in the following order: ddH2O 32.25 µl, PCR buffer 5 µl, PCR DIG labeling mix 5 µl, forward primer 5 µl, reverse primer 5 µl, enzyme mix 0.75 µl, template cDNA 2 µl, final volume 50 µl. Vortex the mixture and centrifuge briefly. Place the sample in a thermal block cycler and perform PCR in following condition: initial denature at 95 °C for 2 min, denature at 95 °C for 10 sec, anneal at 60 °C for 30 sec, and elongate at 72 °C for 2 min, repeat denaturation, annealing, and elongation for 30 cycles, finally elongate at 72 °C for 7 min. Run a portion of each PCR reaction on an agarose mini gel and then stain the gel with ethidium bromide and examine the PCR products under UV. To analyze RNA expression by Northern blot, 30 µg of RNA from each sample preparation was mixed with RNA loading buffer and load on wells in 1.3% agarose formaldehyde gel (see Recipes). Run the gel with 3-4 V/cm in RNase free gel boxes for 4 h until the RNAs are well separated. Stain the gel briefly in 0.25 – 0.5 µg/ml ethidium bromide and examine the gel under UV light. Rinse gels for 2 x 15 min in 20x SSC and RNA on the gel were transferred onto a HybondTM-N+ membrane by capillary transfer with 20x SSC overnight at room temperature. Fix the RNA to the membrane by UV-crosslinking. The energy used is 20,000 µJoules/cm2 at 245 nm. After the UV-crosslinking, rinse the membranes briefly in ddH2O and allow to air-dry. Prehybridize membranes with DIG easy Hyb for 30 min with gentle agitation at 68 °C. Denature DIG-labeled RNA probes by boiling for 5 min and rapidly cooling in ice, and add the denatured probes (25 ng/ml) to 10 ml prewarmed DIG Easy Hyb. 10 ml probe/hybridization mixtures were added to membranes and incubated for 6 h at 68 °C with gentle agitation. After hybridization, membranes were washed with 2x SSC, 0.1% SDS for 2 x 5 min at 25 °C under constant agitation, and then washed with 0.1x SSC, 0.1% SDS for 2 x 15 min at 68 °C under constant agitation. The membranes were then rinsed briefly (5 min) in washing buffer and was blocked in blocking buffer for 30 min. After blocking, membranes were incubated with DIG antibody (Dilute anti-DIG-AP 1:10,000 in blocking buffer) for 30 min, washed 2 x 15 min in washing buffer and equilibrated 3 min in detection buffer. The signal was detected with CDP-Star according to the manufacturer’s instructions (see Figures 1-3). Figure 1. Northern blot analysis of ATF4 mRNA in IBV-infected cells. Vero and H1299 cells were infected with IBV (MOI~1) and harvested at indicated time points. 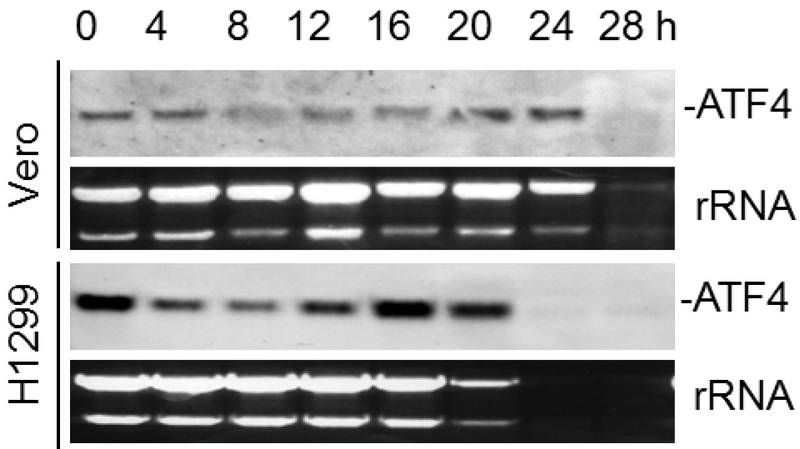 Total RNA was isolated and subjected to Northern blot using an ATF4 probe. Ethidium bromide staining of 28S rRNA and 18S rRNA is shown as a loading control. Band intensities of ATF4 were determined and normalized to rRNA. Figure 2. Northern blot analysis of ATF3 mRNA in IBV-infected cells. Vero and H1299 cells were infected as in Figure 1. RNA extraction and Northern blot was performed as in Figure 1 using ATF3 probe. Figure 3. 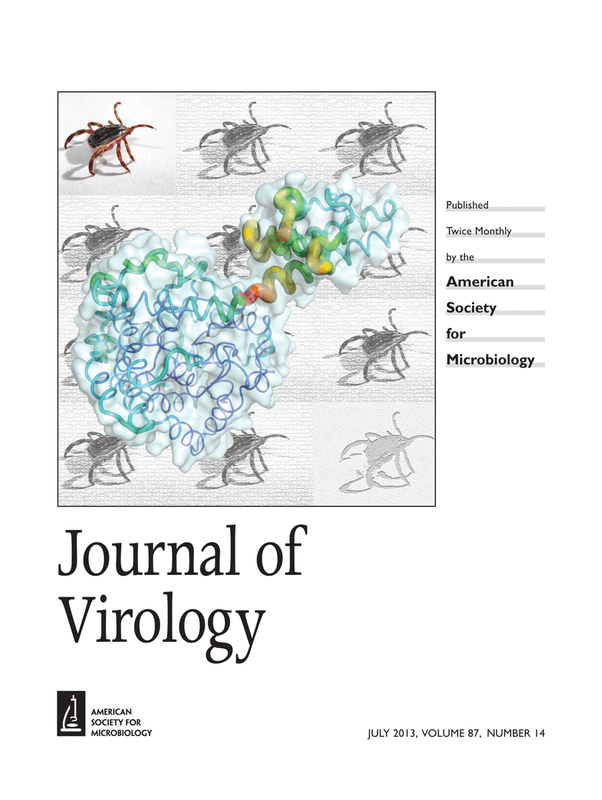 Northern blot analysis of GADD153 at the mRNA level in IBV-infected cells. Vero and H1299 cells were infected with IBV (MOI~1) or incubated with UV-IBV and harvested at indicated time points. 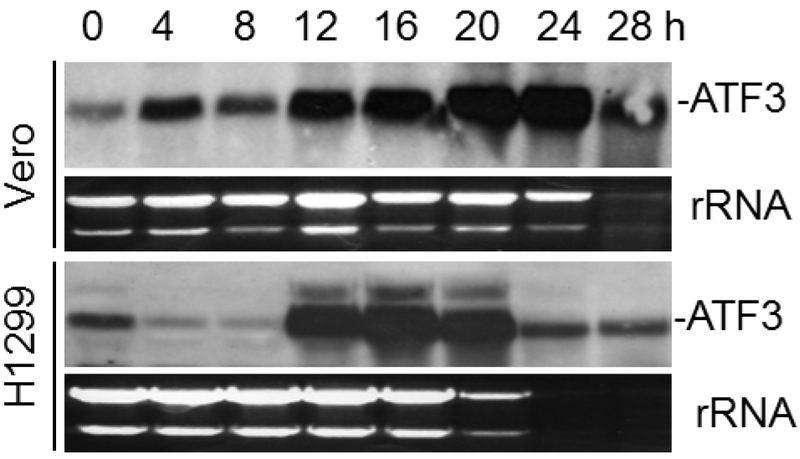 RNA extraction and Northern blot was performed as in Figure 1 using GADD153 probe. Cool to 65°C in a water bath. This protocol was adapted from the previous publication Liao et al. (2013). This work was partially supported by a Competitive Research Programme (CRP) grant (R-154-000-529-281) from the National Research Foundation, Singapore. How to cite: Liao, Y., Fung, T. S., Huang, M., Fang, S., Zhong, Y. and Liu, D. (2014). RNA Isolation and Northern Blot Analysis. Bio-protocol 4(6): e1077. DOI: 10.21769/BioProtoc.1077.